We have another one coming in late October, email if interested. 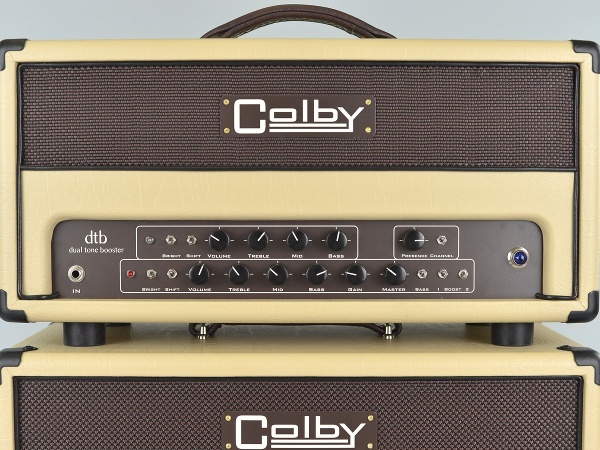 Analog Man carries the Colby Amps Dual Tone Booster dtb-50 head. 50 watts of clean warm tube sound with a second completely independent gain channel. The ultimate no compromise, hand-wired, dual channel amps! With its pure tube and no compromise signal path the dtb, dual tone booster (in both the two and four output tube configurations, dtb50 and dtb100) could just be the ultimate hand wired, dual channel amps. Adjectives that people use to describe the amps like sparkle, fullness, compression, body, focused gain, smooth feel, and touch sensitivity have all been designed in with the careful selection of components including resistors, capacitors, transformers, chassis and tubes. The two versions of the dtb (two and four output tubes) are meticulously voiced and took over two years of tonal development before they were finalized. The amps were built in collaboration with Jim Weider, Tele player extraordinaire and known obsessive tone fanatic. The main goals were to build hand-wired, tone to the bone channel switching amps with two great souding channels, each with its own dedicated EQ (Treble, Mid and Bass) that sounds and has the right feel for any playing situation whether for recording, live or at-home playing. These amps were put through their paces by Jim in both live and recording situations and the development went on until he was more than satisfied! Jim’s involvement was so deep that his signature is on the back panel. For more details on the features and function, please download the owner’s manual. All components selected for TONE! I love this thing! I can’t find a setting that I don’t like. The clean side is amazing, thanks for the settings Mike sent, sounds awesome. The drive side has really pleasant overtones that are musical and never get screechy. Really impressed with the bass response which is fantastic. Overall I love it, totally worth the expense, thanks so much Mitch and Mike!